You'll be £40.00 closer to your next £10.00 credit when you purchase Submarines of World War Two. What's this? 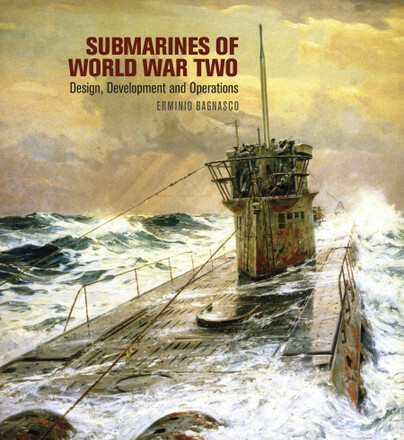 Most of the countless books about submarines in WWII confine themselves to the boats of one particular navy or another: in this book every class of boat, from midgets to the large U-cruisers, of all the nations is covered in detail – more than 2,500 boats – and projected and experimental designs are also included. This furnishes the reader with an overall picture that allows for comparison between the technical and operational aspects of all the submarines that took part in the War. This is further helped by the inclusion of more than 400 illustrations. The author also outlines the evolution of the submarine and submarine warfare – including the interplay of wartime experience, design improvement and tactical innovation – thereby placing the subject in its true historical perspective. The description of each class of submarine begins with a wealth of statistical data, including number of boats in the class, names, dates and locations of builds, dimensions, complement, and performance data. The design and development of each class is discussed and its significant contributions are covered. The final disposition of every boat in the class is listed, and, if lost, the means by which it was lost is given. In some cases, as for instance with Germany's Type VII boats, these lists can be very lengthy -- a grim reminder of the appalling human cost of WWII submarine warfare. Submarines of World War Two is printed on glossy stock and profusely illustrated with line drawings (in the form of cross-sections and outboard and inboard profiles) and black-and-white photographs. It rewards the casual page-turner as well as the serious student of naval history. A must I think for anyone with a historical interest in submarines. Still the best single-volume coverage of the subject. It is likely to have wide appeal to readers interested in submarines, submarine warfare and general ‘things naval’. Military historians interested in submarine operations may find it of use, while warship modellers and war-gamers with an interest in submarines may find it to be a useful reference source. ERMINIO BAGNASCO is the Editor of Storia Militare, Italy’s leading military journal. He is the author of many books on Italian warships, and is widely regarded as the foremost authority. For this volume he was assisted by AUGUSTO DE TORO, a member of the staff of Storia Militare, and himself the author of many articles and monographs.